The Explorer is the first of Sentinel's boats. The design arose from Pierre's need for a boat that he could sail with two small children. 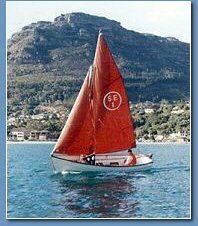 The design brief was for a sturdy, seaworthy open boat that could be rigged, launched and sailed single-handed while Pierre's wife, Wendy, kept an eye on the kids. The boat had to be light enough to be towed behind the family car, and seaworthy enough to take the unpredictable weather around the Cape Peninsula. Pierre liked the lines of the Argie 15 that Dudley had designed a few years previously, but wanted a bigger boat, built with the wide lapstrake construction that made Joel White and Ian Oughtred's designs so distinctive. Having learned to sail on clinker built Montague whalers, Pierre has a love of the chuckle of water against the lands that only a clinker hull can produce. The wide strakes would also make GRP production easier. The boat Dudley drew met all the requirements. The 6ft beam is carried quite far forward, while the stern has just a hint of tumble home. The interior of the hull is spacious and easy to move around in. Deep bulwarks keep the children in, the water out, and are comfortable to lean back against. 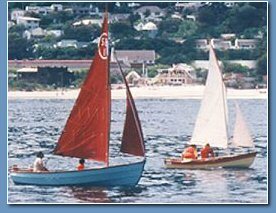 The galvanised steel centreboard is easy to lower and raise by means of a simple tackle. There is plenty of stowage under the side seats and in a locker aft, while a cool box next to the helmsman keeps the necessary liquid refreshments cool. Wooden floorboards keep your feet out of whatever water may find its way into the boat and serve as stowage for the oars. The 18ft wooden mast fits inside the boat for convenient trailing and is easy to step single-handed. Rigging the boat takes about twenty minutes. The gunter rig is simple and easy to use even for the absolute beginner, but allows the more advanced sailor to tweak it for better performance. Under sail the boat is comfortable and forgiving. The hull shape makes the boat very dry and stable, while the low centre of effort of the rig allows the boat to stand up to her sail with ease. The mainsail has no boom to endanger young, and not so young, heads, but the foot of the sail is stiffened by a batten to retain sail shape off the wind. An optional roller furler fitted to the jib makes that sail very easy to handle. The boat moves easily in light winds, but will handle weather up to force six (or above in case of need) with ease and in safety. The boat is well balanced on all points of sail, giving a pleasantly light feel to the helm. The outboard motor is mounted in a custom well that allows the motor to be tilted athwartships inside the boat. A 4-5 hp motor drives the boat at hull speed with no fuss and little noise. The Explorer is a great boat for family cruising, gunkholing or just pottering about.